Mayor Mark Barbee, seen standing in the neighborhood "below the tracks" in Bridgeport, Montgomery County, has faced death threats and racial attacks in the 10 months since he was elected. They continued with a 'vague' threat tied to the October 23, 2018 meeting. 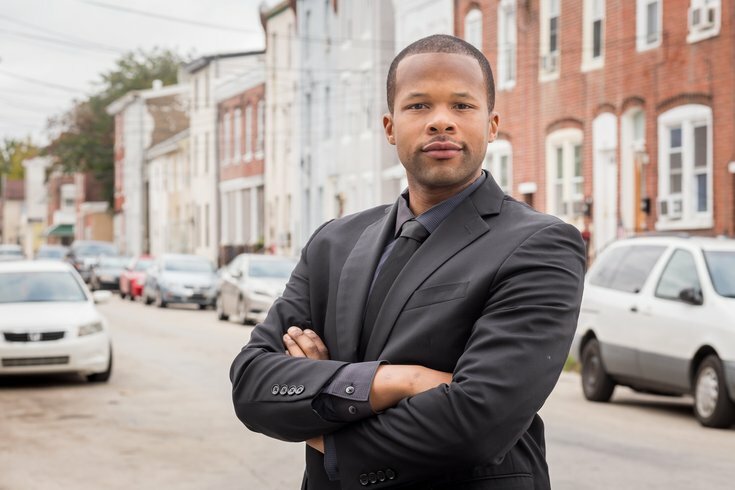 When 29-year-old Mark Barbee was elected to serve as mayor of Bridgeport, Montgomery County last November, it was a historic moment for a municipality that’s seen better days a rock-skip across the Schuylkill River from Norristown. Barbee – the former councilman who drew 454 of the 864 votes cast – would be the first openly gay, African-American mayor of this tiny blue-collar borough. But less than a year later, the only history being made is far from good. In the nine months since his swearing-in, Barbee has been the focus of death threats, profane tirades at public meetings and a slew of racially charged comments – both veiled and otherwise. It’s gotten so bad that friends say they worry whether he's safe to walk home alone from Borough Hall at night. Much of the discord stems from controversy within the borough's 12-officer police department. One councilman – who resigned and then rescinded his resignation before the legislative body could accept it – stormed out of a meeting after allegedly asking Barbee why he'd cite a Dr. Martin Luther King Jr. quote about equality since "he's been dead for a long time." At another meeting, that councilman screamed "F*** you, you're an a**hole” at Barbee several times on his way out of council chambers. He hasn’t returned for the past three council meetings, much to the dismay of his constituents. Ratcheting up the discord even further, several councilmembers have entertained the notion of changing to Home Rule Charter to eliminate the borough police department and turn over responsibility for public safety to officers in Upper Merion Township, which surrounds the borough on three sides. Dozens of the borough’s fewer than 5,000 residents who packed the traditionally emptier council chambers for the past several meetings said they’re angry, embarrassed, concerned and worried about what they’ve seen unfold from those elected to represent them. Just a few days after yet-another heated council meeting in mid-September, Mark Barbee took a seat in a booth at a cozy little diner in Willow Grove. He was quick to smile broadly, laugh loudly and answer uncomfortable questions. If the idea of people in positions of power working to undermine his authority has gotten to him, he does a pretty good job of hiding it. In fact, he was able to laugh it off to a certain extent, thanks to the absurd behavior he's witnessed in the past several months. Over lunch, he shared details of his path to the mayor’s office and the resulting chaos. Originally from Rapid City, South Dakota, he came to Montgomery County when his mother, who was raised in Norristown, retired here years ago. When he left the family house in Plymouth Meeting in 2010, he moved to Bridgeport. 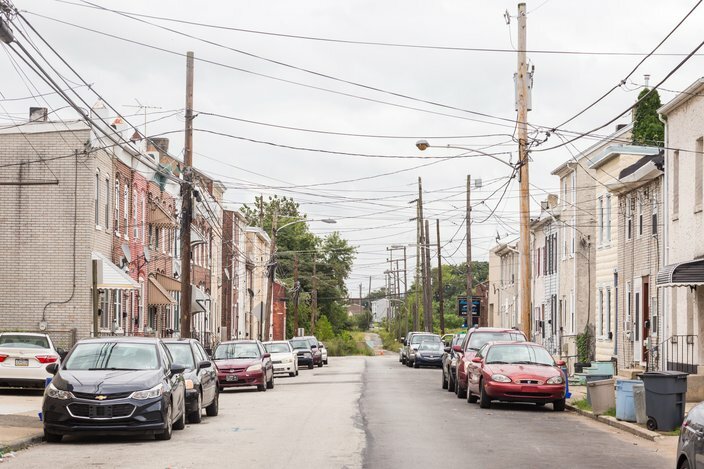 Not unlike many Philadelphia neighborhoods or suburban towns seeking to revitalize, shifting demographics have meant finding a way to mesh younger newcomers with old-timers who may not be as keen on – or resist outright – efforts to change. The challenge is balancing those efforts while maintaining an old-town feel. 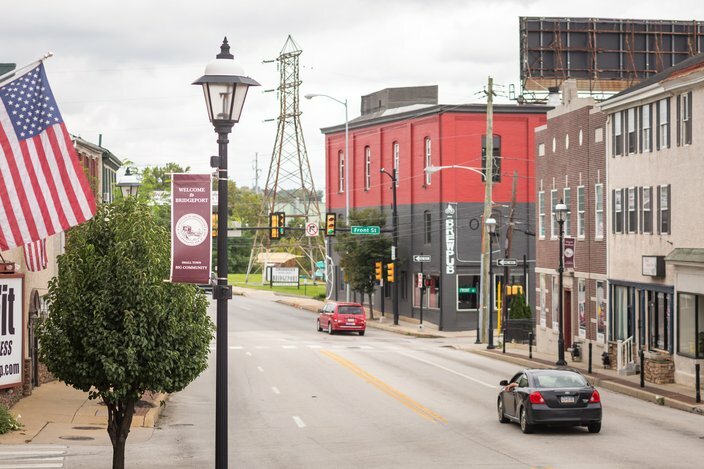 In March, a local newspaper ran a lengthy feature about Barbee and his hopes of revitalizing an “old mill town” into a destination for eating, drinking, strolling and raising a family. It was a puff piece, but one that didn’t sit well with some folks in Bridgeport. Barbee recounted a conversation with Council President Bill Lawless Sr. – the town official who stormed out of a later meeting and rescinded his resignation – as an example. "What’s with you putting gay and black in that article? Are you saying I can’t be on council because I’m white?" Lawless asked, according to the mayor. Things would devolve further within weeks when, a few months into his mayoral tenure, Barbee proposed the formation of a human relations commission in the borough. He was hoping to implement an “anti-discrimination policy” in town, much like other municipalities. When a motion to draft the ordinance was offered at the April 10 council meeting, three members voted against it: Council Vice President Randy Bennett as well as Bill Lawless Sr., and his son, William Lawless Jr.
A trio of residents then spoke up to say they “did not feel Borough needs this ordinance and … the Borough did not discriminate,” according to the meeting’s minutes. Two weeks later, the ordinance was approved by 4-3 vote, but passage wasn’t the intended victory for Barbee, who was named by Gov. Tom Wolf in August to the commonwealth’s first statewide LGBTQ Affairs Commission. He brought up several slights, ranging from the former mayor's name continuing to appear on the borough’s quarterly newsletter after his election – he thinks it was intentional since the new council members' names were listed – to offensive and threatening social-media posts, and comments about the way he talks. Barbee said that’s not the case, but defended their right to express ignorant thoughts. At an April meeting, Barbee said the elder Lawless asked why he didn’t bring up issues about equality while he was on council. After the mayor cited the MLK quote – “The time is always right to do what is right” – the councilman snapped, saying the civil rights leader has been dead for a long time so why bother citing his quotes, according to Barbee. Barbee said those details were initially left out of the meeting's minutes but they would be amended after he asked at a May 22 meeting that Lawless's refusal to apologize for the King comment be added to the record. “When I was appointed chief, I believed the mayor was going to delegate the authority to direct the police department. It became clear to me that the mayor felt compelled to override some personnel changes I was making based on what he perceived, and still perceives, as being based on a political agenda or others. “This lack of trust does not bode well for the department. I did not sign up for the political struggle that continues here. I accepted the position to help fix a situation that has been bad for years. The resignation, of a chief said to be handpicked by Lawless Sr., was just another spin of the revolving door at the helm of a Bridgeport force composed of eight full-time and four part-time officers. The department, which responded to 4,264 calls for service last year, down from a recent high of 6,939 in 2012, has seen six different leaders in the past eight years, and that's worrisome to residents who connect with their officers in a tight-knit way. Barbee unsuccessfully tried to set up a meeting to broker peace after the announcement, publicly stating that he didn’t want Shannon to resign. Still, he stands by his questions about the chief’s stepped-up patrol plan that sparked the discord between the two. “When he said there would be aggressive patrols in the ‘most-troublesome areas,’ I asked about data and he didn’t have any to support it. I felt like that was racial profiling, because that area is largely minority,” Barbee said. Bridgeport police Officer Shannon Sell said that there is some validity to Barbee's concerns. A departmental outcast who has been "harassed and retaliated against" – she reached settlement with the borough on a harassment complaint in 2014 – Sell mentioned a conversation she had with Lawless not too long ago when asked about the proposed targeted enforcement. 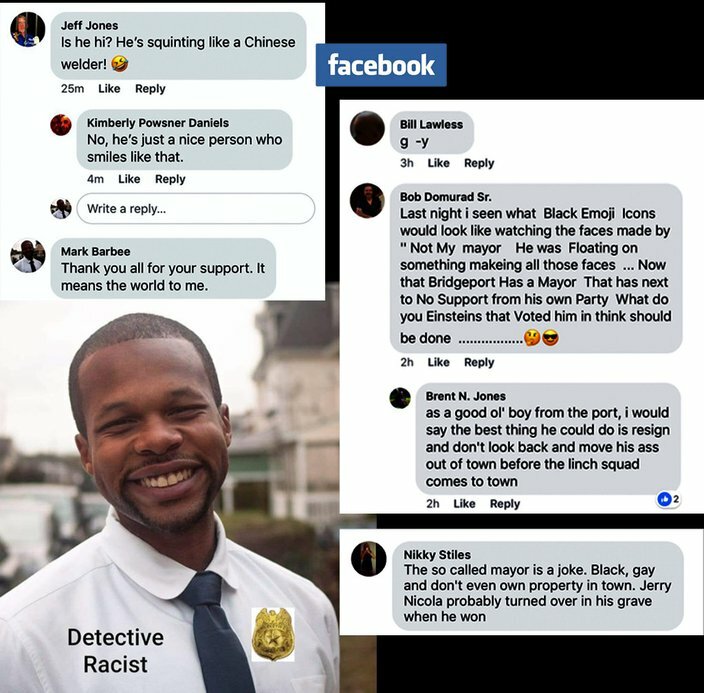 Bridgeport Mayor Mark Barbee has received threatening and racist messages on social media since being sworn in earlier this year. Many of the posts have been deleted but he kept screenshots as officials from the state and Montgomery County District Attorney's Office investigate the threats. "In my opinion, the borough is so small that there is no need for targeted enforcement." For his part, Barbee did not want his name attached to supporting such a move. Many of the personal threats were deleted but Barbee admitted “we got receipts” – in the form of screenshots. To Kyle Shenk – a first-term councilman who ran alongside Barbee and whose platform included fair, equitable policing – the reactions were beyond the pale. Barbee said he felt like the chief's resignation was a set-up. Though the resignation was said to be secret until that night, council chambers were as packed as he’d ever seen them, with the crowd heavily tilted against Barbee. When the elder Lawless called him an “a**hole,” loud applause came from many in the audience, including seven officers in uniform, only one of whom was off duty at the time, according to the mayor. “Police officers clapping and cheering as I’m being ridiculed? If this was Philly, it would be national news,” he said, noting that a video recording of the session conveniently didn’t show the areas where the officers were standing. 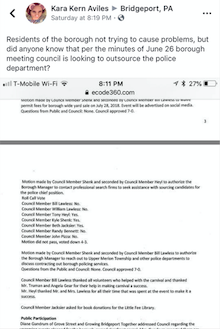 To Sell, the police officer, that was part and parcel of a situation in which council members have demanded resignations from her and Barbee. "They're not quiet or shy about it," she said. "They've said 'we don't need you or your kind' here." Lawless’ harsh words, delivered directly to Barbee’s face, prompted the mayor to reach out to a police department that didn’t seem to like him all that much in the first place. “Bill Lawless should’ve been cited for disorderly conduct. Chief Shannon disagreed and forwarded my request and his refusal email to Lawless,” Barbee said. “After that, things radically changed....That’s when the death threats and overtly racist comments about me started. The plan was to run me out of town. Both the Montgomery County District Attorney’s Office and the Pennsylvania Human Relations Commission learned of the threats from residents. The status of those investigations – and an earlier State Police inquiry – is unknown. When word got out about the investigations, though, the threats stopped and the meetings calmed down, at least for a while. Barbee said the campaign to oust him from office didn’t relent, though. 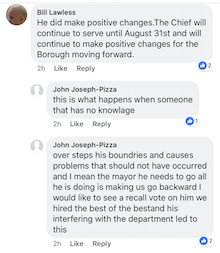 Bridgeport council members discussing the police chief's resignation via Facebook. It also would strip the mayor of police department oversight, and Barbee wondered if his position would even be safe. That motion passed 4-3 with Pizza, Bennett and both Lawlesses voting in favor. Soon thereafter, the younger Lawless resigned his post and the elder would stop attending meetings. Months passed with no updates regarding the proposed home rule change, but Barbee would discover that locks were changed and computers were moved from offices that he no longer shared access. To Barbee, this all comes back to him questioning the need for aggressive patrols. If provided proof they were necessary, he said he would’ve signed off on the push. Instead, it fueled Bridgeport’s ugly political war. For his part, Shenk said the potential police merger was not a way for critics to take a shot at the mayor. It’s about being “as fiscally responsible as possible” regarding a line item (the police department) that eats up a major chunk of the borough’s budget, he said. 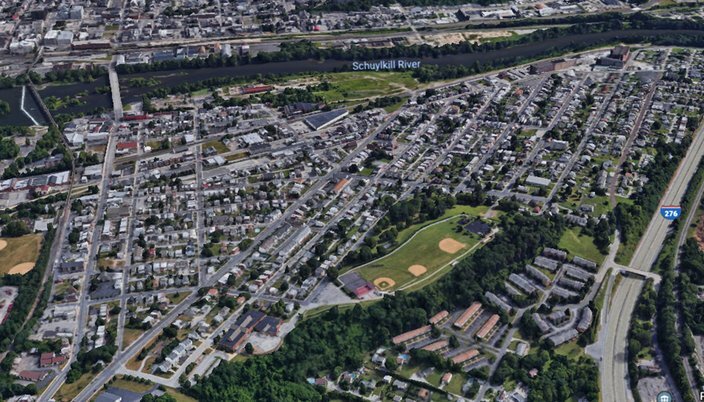 Bridgeport sits between the Schuylkill River, the Pennsylvania Turnpike and Upper Merion Township. The borough council is considering changing to a Home Rule Charter that would all allow, potentially, for the town to be patrolled by Upper Merion police. If things quieted down over the summer, they picked right back up with angst aplenty at the council’s meeting on September 11, just one day after Barbee posted a lengthy memorandum about the police chief issue. With Lawless still serving in absentia, it was Bennett's time to scream before a standing-room-only audience. Pizza responded that it’s merely being explored as a way to prevent future tax hikes. Barbee said he “adamantly" opposes the move as it could mean 12 police officers who’ve established close relationships with the community could find themselves out of work. “I would like a seat at that table,” Barbee said, referring to a committee that his foes adamantly claim has not yet been formed. They say there's only been one meeting with Upper Merion officials. That's when Bennett started yelling at Barbee, claiming that he “destroyed” the former chief’s life. Residents were taken aback. To them, it all but confirmed the stigma that leaves people in Upper Merion looking down on Bridgeport residents as “scum,” went the thinking of one resident who stood up to be heard. Just before the meeting adjourned, longtime resident Gina Plisievwicz addressed Pizza directly. “Jack, do you remember the last time we tried to do this? What happened?” she asked. “A public outcry,” came the response. “I fought for the Bridgeport Police Department then, and I will do the same thing now,” she said. Though Pizza wrote in an email last week that he'd make himself available for an interview, he did not respond to several follow-up emails. Lawless Sr. and Bennett had agreed to discuss the state of affairs with PhillyVoice over breakfast last Wednesday – news of the planned interview made its way around the borough grapevine within hours – but those plans fell through. Neither responded to follow-up calls and emails seeking comment. Everyone in Bridgeport expects the meetings – the next one is Tuesday night – to remain packed for the foreseeable future, primarily because of the police-consolidation controversy. He conceded that coordinated opposition has left him on the brink of tears. Getting locked out of the police department – the proverbial straw that broke the camel’s back – has only inspired him to redouble his efforts on behalf of his constituents. But he remains worried about his safety. Kara Kern is among the Bridgeport residents who worry about outsourcing public safety duties. “With the death threats, I certainly took them seriously,” he said. “When I was walking home two, three blocks, my friend Cassandra pulled up, saying, ‘What are you doing out here by yourself? Mark, they got guns.’"
Resident Kara Kern, who attended the September 11 meeting, told council members that they’d better shape up or she’ll work to get them voted out of office. Residents deserve to know what’s going on with the proposed police merger, especially since she, as a lifelong resident, has been on the receiving end of look-down-the-nose dismissal from Upper Merion residents, she said. Why has Barbee faced so much vitriol? And that’s exactly what Barbee said he hopes to do.